Dannii Martin’s warming carrot and lentil soup recipe is perfect if you're looking for an easy and healthy lunch. To make it into more of a meal serve it with a hunk of crusty bread and a dollop of Greek yoghurt for a simple midweek meal or winter warmer. There's nothing much more comforting on a cold day than a big bowl of hot soup. If you needed any more convincing, soup is really simple to make, cheap and an easy way to eat lots of healthy vegetables in one meal. In the interest of saving as much money as possible, I am looking at healthy meals that won't break the bank. Lentils are the ideal budget ingredient, especially if you buy them in bulk, and are low in fat and a good source of protein and fibre. As well as being a great ingredient in soups, lentils are a great way to bulk out meat dishes like shepherd's pie – saving you money and also lower the fat content of the dish. 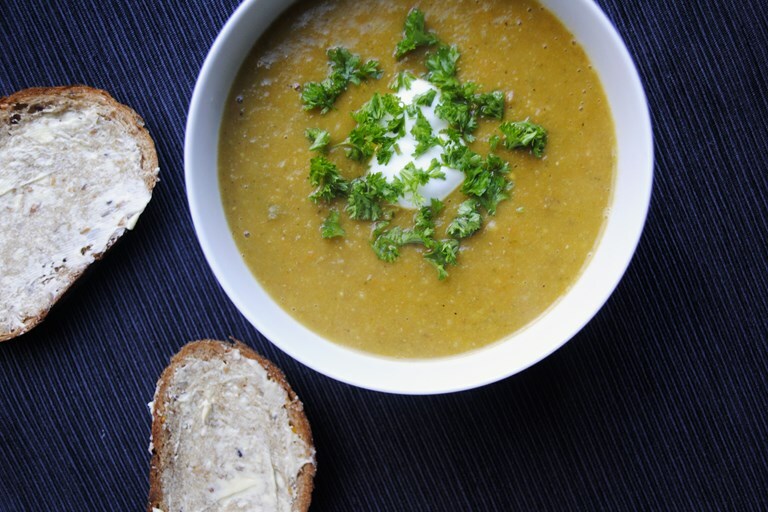 This soup is very low in calories, making it a fantastic snack, but to make it into more of a meal, serve it with some freshly baked bread or for an indulgent twist, try sprinkling a little cheese on top.